The inspiration for this latest salad obsession arrived courtesy of a catering delivery to our office that included this dish in all of its green goodness. Crisp tender vegetables (sugar snap peas, broccoli and edmame), vibrant color and lots of flavor - my only complaint was the heavy dose of vinaigrette. The oily slick on the restaurant version makes you feel like you are undoing all the good done by eating your greens. I absolutely think this salad needs some sort of dressing and a bit of fat, but for me, a drizzle of toasted sesame oil and a sprinkling of salt is sufficient to bring out an earthy, delicious flavor. Whatever you do, do not skip the blanching step. It makes all the difference to get the vegetables just the slightest bit tender and it certainly doesn’t hurt in preserving the vibrant green color. Blanching traditionally includes a quick dunk in a bowl of ice water to arrest the cooking, but here I opt for stirring in the frozen edamame after the vegetables are drained. They help to quickly cool down the other vegetables, while the residual heat from cooking thaws the edamame. If you prefer an ice bath, by all means use the traditional method, but if you, like me, find yourself without an ice maker and vast quantities of ice on hand, stirring in the edamame works well here. Put a large pot of water on the stove and bring to a boil. While the water is heating, prepare the vegetables. Remove the stem-end of the sugar snap peas and if desired, the string that runs the length of the pea. Cut the peas on the diagonal into 1/4“ to 1/2“ segments. Roughly chop the broccoli florets. Once the water comes to a boil, add a generous amount of salt (at least 1 tablespoon). 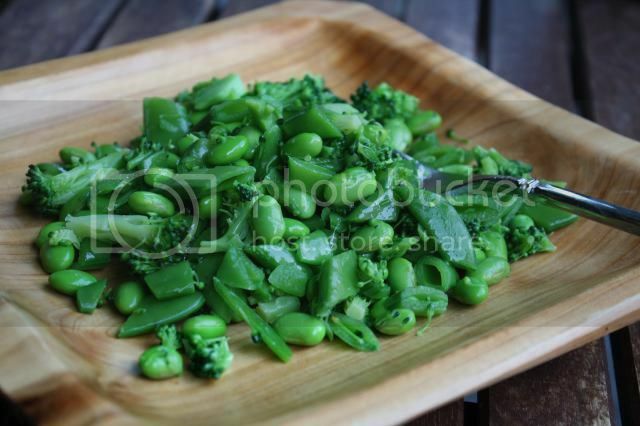 Add the sugar snap peas and broccoli to the water and cook for two minutes. Drain the vegetables in a colander and stir for one to two minutes to speed cooling. Add the frozen edamame and stir until the edamame is thawed – an additional one to two minutes. Transfer the vegetables to a bowl and stir in two tablespoons of the sesame oil and salt generously. Taste the mixture and if the sesame flavor is mild, add more to taste. This salad looks so fresh and healthy! I love that the vegetables retain such bright colours. Good, We are so interested on this topic.following time I learn a blog, I hope that it doesnt disappoint me as much as this one. I mean, I know it was my choice to learn.